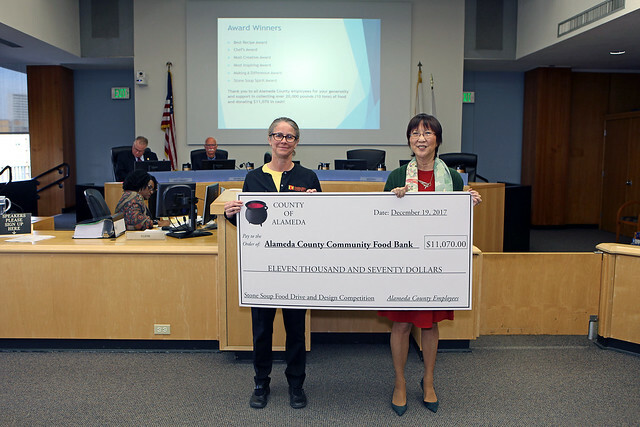 In it’s fifth year, a record 16 County departments participated in our Stone Soup Food Drive and Design Competition, raising more than $11,000 in cash and 20,000 pounds of food for the Alameda County Food Bank. 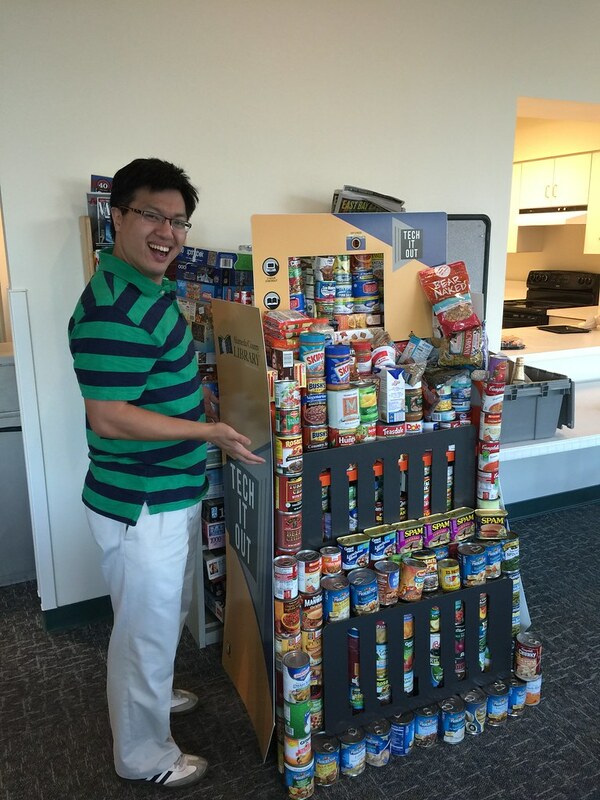 An outpouring of compassion and creativity helped Alameda County’s 2016 Stone Soup Holiday Food Drive and Design Competition achieve unprecedented success in raising employee donations to the Alameda County Community Food Bank. County employees donated more than 9 tons of food and $14,000 in cash over the past five weeks to help put meals on the tables of less fortunate residents during the coming holiday season. Both numbers represent new records in Alameda County’s annual Holiday Food Drive. 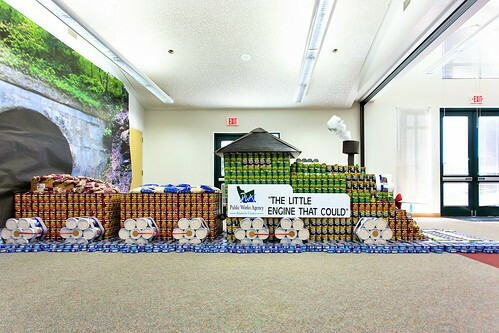 Employees also used donated food items to fashion creative displays that currently adorn public areas of many County buildings. The displays are designed to engage visitors about the issue of hunger in the community. The creations will soon be dismantled and their edible components will be donated to the Food Bank to help provide nutritious holiday meals to residents struggling to put food on the table. A surge of compassion and creativity helped Alameda County’s Third Annual Stone Soup competition reach unprecedented success in raising employee donations to the County’s annual Holiday Food Drive in support of Alameda County Community Food Bank. County employees donated more than 6.5 tons of food and over $13,450 in cash to help put meals on the tables of less fortunate residents during the coming holiday season. In all, 14 County departments participated in this year’s competition. Using food items they created several imaginative displays, including: a replica of Hayward’s historic Meek Estate Mansion; a “Kingdom of Can-a-Lot and the Knights of the Full Table;” a detailed model of Oakland’s Rene C. Davidson courthouse; a model of the robot “Wall-E,” that combines food packages with some high-tech gadgetry in a depiction of the Pixar Animation movie character; and a replica of the Oakland shoreline, complete with the Port of Oakland’s towering cargo cranes. 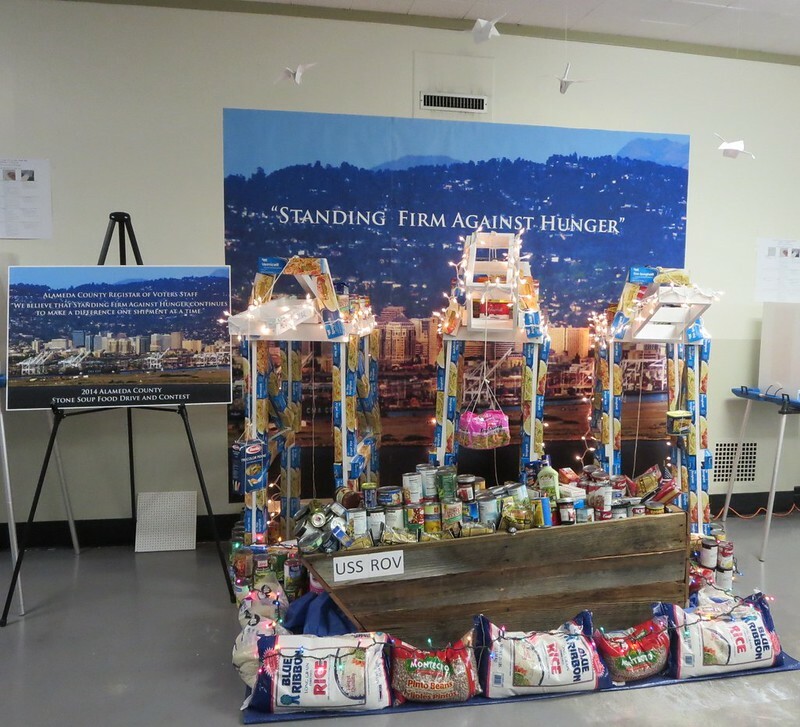 Alameda County’s first-ever Stone Soup Holiday Food Drive and Design Competition, which culminated in November with some inspired displays made entirely with boxes and cans of non-perishable food. 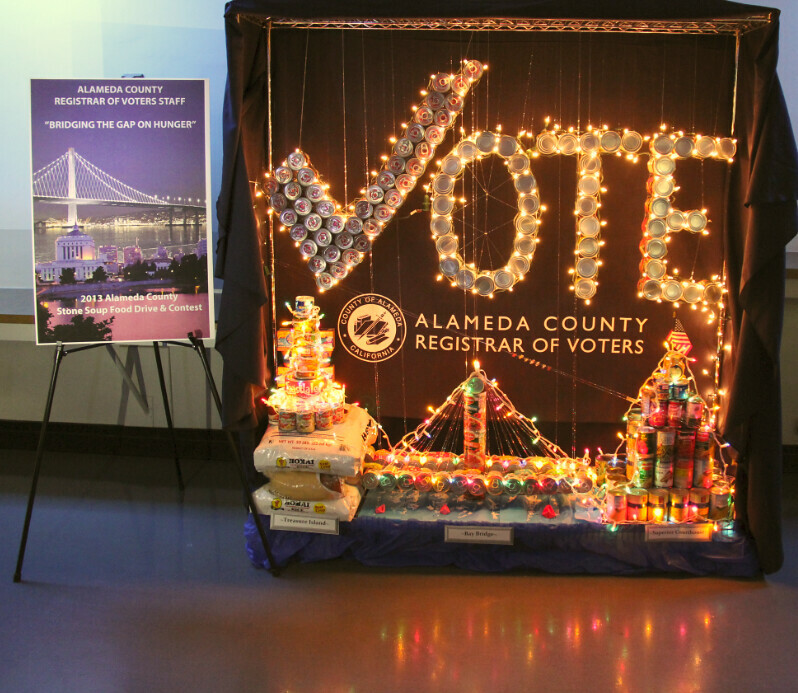 The imaginative creations included a Bay Bridge montage, a computer work station and a 3-D depiction of Alameda County with landmarks such as Mission Peak and the Altamont windmills – were created with 10,000 pounds – or 5 tons – of edibles donated by County employees in time for the holidays. The total donations mark a more than 3-fold increase over last year’s total.